Costa-Gavras’ Z may have won the Oscar for 1969’s Best Foreign Film, but as one of the few movies to be nominated in both categories, it should have also been named Best Picture—an honor that went to the superb, if nonetheless inferior, Midnight Cowboy. Shot in French, the Greek-born director’s third feature is based on Vassilis Vassilikos’ 1966 novel, and presents a fictionalized account of an assassination attempt that, as its introductory text bluntly states, is intended to resemble real life. Far from a staid docudrama account of an actual murder and the political/legal fallout, Z is a soaring thriller that rages with righteous fury. It’s an apt attitude for its story, which concerns the events surrounding a nuclear disarmament speech by democratic leader Deputy Grigoris Lambrakis (Yves Montand). His remarks are met with violent protests, tolerated (if not outright encouraged) by the police and its chief (Pierre Dux), who—in an opening scene—likens the “-isms” of the day (liberalism, socialism, communism) to corrosive mildew. After Lambrakis’ rally, he’s mortally wounded by a man on a truck with a club, thus setting in motion an investigation that forms the heart of Z. 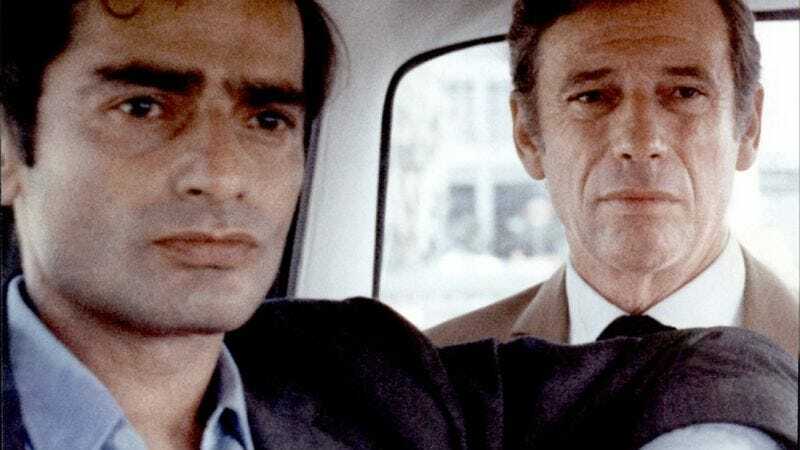 Assigned to look into the murder, a young magistrate (Jean-Louis Trintignant) comes to understand that his bosses and the ruling military regime’s bigwigs expect him to deem the case a simple drunk-driving accident. Yet a raft of evidence courtesy of autopsies, witnesses, and photographs—some coming to his attention via the aid of a journalist (Jacques Perrin)—soon reveal a far larger conspiracy that puts him, and those around him, in jeopardy. Be it silent flashback montages that sharply interject themselves into the present-day action, or cross-cutting that works in tandem with handheld cinematography to create a sense of thrilling urgency, Z proves to be a taut, engrossing journey through a thicket of institutional corruption. It’s a procedural about individual and national crimes against democracy (and the truth) that’s ultimately so bleak, it almost veers into jet-black comedy. Availability: Z is available on Criterion DVD, which can be obtained from Netflix or your local video store/library, and to rent or purchase from the major digital services.